The Conception by Saint Anna, of "Whence is Conceived the Holy Mother of God"
The Conception by Saint Anna, of "Whence is Conceived the Holy Mother of God": Saint Anna, the mother of the MostHoly Mother of God, was the youngest daughter of the priest Nathan from Bethlehem, descended from the tribe of Levi. She entered into marriage with Saint Joakim (their mutual memory is made 9 September), who was a native of Galilee. For a long time Saint Anna was childless, but after a span of some 20 years, through the fervent prayer of both spouses, an Angel of the Lord announced to them the Conception of a Daughter, Who would bring blessing to all the human race. The Conception by Saint Anna took place at Jerusalem, where also was born the MostHoly Virgin Mary by name. The majority of icons, dedicated to the Conception by Saint Anna, portray the MostHoly Virgin trampling underfoot the serpent. "Down the icon, along its sides, Saints Joakim and Anna are depicted usually with upraised hands prayerfully folded; their eyes also are directed upward and hey contemplate the Mother of God, Who as it were soars in the air with outstretched hands; under Her feet is portrayed an orb wound round with a serpent symbolising the devil, which in the face of fallen forefathers strives to conquer with its power all the universe". 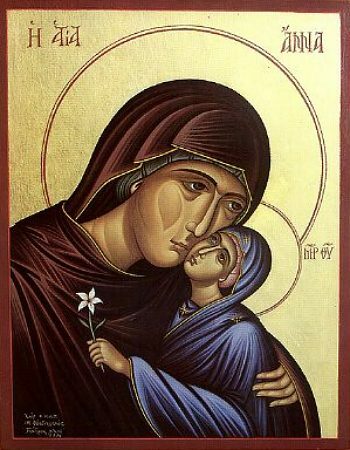 There also exist icons, upon which Saint Anna holds on her left arm the MostHoly Virgin at an infant age. Upon the face of Saint Anna is portrayed a special reverence. An ancient icon of large size, written on canvas, is located in the village of Minkovetsa in the Dubensk district of Volynsk diocese. And from ancient times this feast was especially venerated in Russia by pregnant women.